Nature's finest! This beautiful vacation rental offers a main house which accommodates up to 13 people and 5 individual cottages that accommodate up to 4 people each. The beach area offers a spectacular view of Butternut Lake and a lakeside dock to enjoy fishing. There are picnic tables and a firepit down by the beach to enjoy roasting marshmallows and having family gatherings. 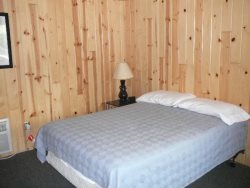 This webpage is strictly for informing people that Thunderhead Lodge accommodates up to 33 people. You are not able to reserve these units from this page. In order to book the Main House or any of the cabins, you will need to go to the specific page for the property that you are looking at and book from there. Thank you!